Tongji Medical College of Huazhong University of Science and Technology was first founded in 1907. Before merging with HUST, it was a key medical university and directly under the leadership of the Ministry of Health. The comprehensive strength in teaching and research ranks the top of China's medical universities. 5 Tri-A hospitals totally with 5400 beds are attached to Tongji Medical College, among which both Thongji Affiliated Hospital and Union Affiliated Hospital are the top-ranking hospitals in China. Complete medical departments, solid technological strength, advanced diagnostic equipment and rich clinical experience made Tongji Medical College China's standardized clinical teaching base, as well as the diagnostic and therapeutic center in central China. Students can do the internship or training only in China. HUST would offer students one of the affiliated hospitals - Tongji Hospital and Xiehe Hospital to choose. Besides, students have to take the final examination on Theory Test and Clinical Evaluation. 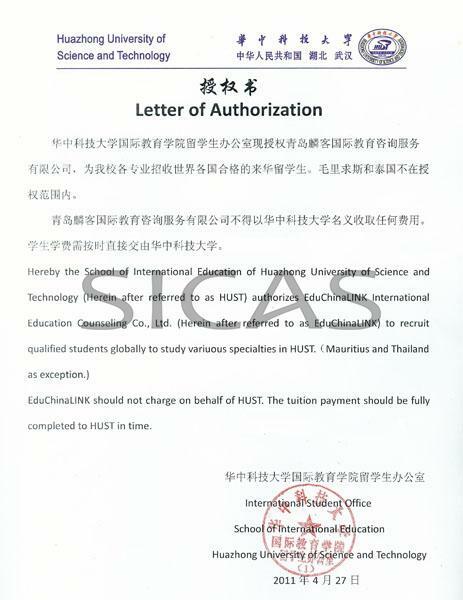 Students are required to pass HSK 3before graduation; otherwise they cannot get the degree. Note: In the first year students could learn the Pre-Med Education for Chinese language training and English instruction of high school level courses in Mathematics, Physics and Chemistry. After then, there will be the medicinal courses. Every semester's curriculums will be adjusted according to the university arrangement. 1. For students aged below 30. 3. At least 60% score in science subjects: Mathematics, English, Biology, Physics and Chemistry.